As we enter the Winter Meetings, the Yankees are still searching for two relievers to replace Zach Britton and David Robertson. I previously wrote about Kelvin Herrera, Andrew Miller, Jeurys Familia, and Adam Ottavino. Today I’m going to shift gears a bit, and focus on pitchers that had substandard years without the benefit – if you can call it that – of an injury explanation. 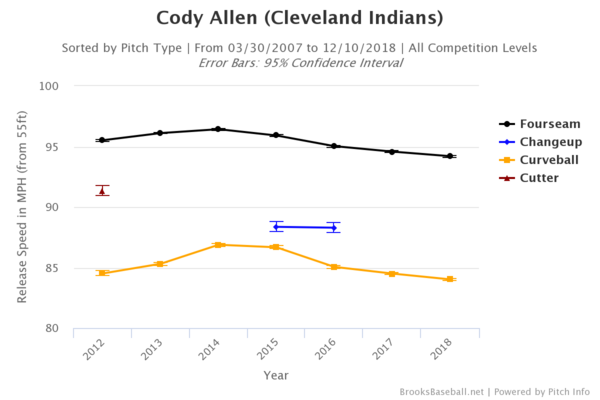 Allen was somewhat quietly an excellent reliever for five straight years, pitching to a 2.59 ERA (163 ERA+) along with 32.4% strikeouts and 8.8% walks in 344.2 IP between 2013 and 2017. He served as Cleveland’s closer for four of those seasons, too, holding onto the role even as Andrew Miller came into the fold. In that time, Allen was the 9th most valuable reliever in the game by fWAR, and 12th by WPA. He may not have had the flash or name value of the pitchers around him, but he was steadily great, and occasionally brilliant. And then, in his age-29 season, he had the worst year of his career. His strikeout and walk rates were his worst since his 29.0 IP debut in 2012, and his GB%, ERA, and FIP were the worst of his career. Allen had quietly been susceptible to the longball for a couple of years, but it got out of hand in 2018 as his HR/9 skyrocketed to 1.48. His 12.8% HR/FB wasn’t too out of hand, but allowing 50.6% of all batted balls to be put into the air doesn’t jibe too well with that. The spin on both of his offerings dropped from 2017 to 2018, as well. Allen’s fastball checked-in at 2506 RPM in 2017, and 2445 RPM in 2018; for his curveball, those numbers were 2617 and 2575. For a pitcher who relies on two pitches, it’s easy to imagine that losing a bit of heat and a bit of spin could have horrendous results – and that manifested last year, as Allen allowed a much higher exit velocity (up 4.1 MPH) and launch angle (up 1.6 degrees) in 2018. Are there any positives to be gleaned from his 2018, though? No; not really, at least. His numbers were bad in every month but April, and he was shelled in both of his playoff outings against the Astros (54.00 ERA – not a typo – in 1 IP). Unless Allen was hurt at the end of April and some nagging injury kept him down for the rest of the year, this has all of the makings of a straight-up bad year for the now 30-year-old. And it couldn’t have been more poorly-timed for him. MLBTR (two years, $16 MM) and FanGraphs (two years, $18 MM) basically agree on the sort of contract Allen will sign this off-season. Cleveland didn’t extend the QO, so there’s no additional cost beyond the dollars and cents. Allen is an interesting case, given that he was so good for so long, which isn’t terribly common for relievers. His whole career has been in the AL, and he was incredibly effective in the playoffs prior to this year, too. If he had hit the free agent market after 2017, Allen may well be looking at a huge payday. As it stands, he might have to settle for something of a pillow contract. I would be hesitant to give him two years, as relievers do have a nasty tendency to abruptly fall apart, but I would be fine with a one-year deal. 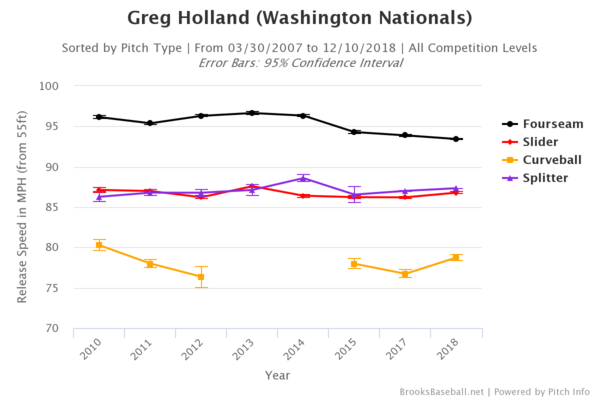 Holland was arguably the best reliever in baseball from 2011 through 2014, pitching to a 1.86 ERA (220 ERA+) in 256.1 IP in the regular season, and a ludicrous 0.82 ERA in 11 postseason innings. 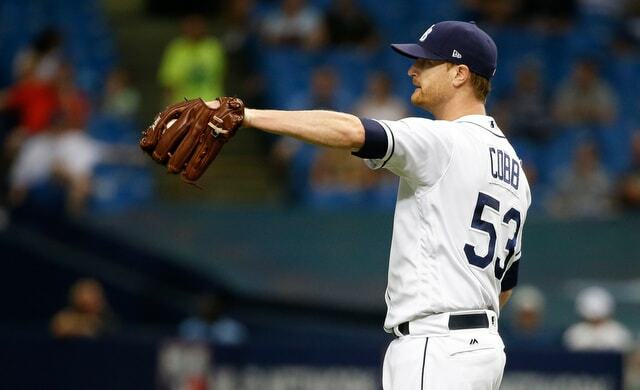 He was a mere mortal in 2015, however, with a 3.83 ERA (110 ERA+); and his season ended on September 22 of that year, when the team announced he needed Tommy John Surgery. He missed all of 2016, and was a man without a team for that entire year. In January of 2017, Holland was healthy and ready to go, and he signed a one-year deal with the Rockies. It was a strange choice for a pitcher hoping to rebuild his value, but he did quite well, pitching to a 3.61 ERA (140 ERA+) in 57.1 IP, with a strong 29.8 K%. The walks were high (11.1%), but, for a guy in a bad pitching environment with a year’s worth of rust, that was more than forgivable. Holland nevertheless had to settle for another one-year deal for the 2018 season. This time, the Cardinals came calling – but not until March 31. What a weird off-season 2017-18 was. But I digress. Starting his season so late may well have played a role in Holland’s pre-trade struggles, but did anything else change? He did spend a bit over three weeks on the DL with a hip impingement in late-May and early-June – an injury which had bothered him for a couple of weeks prior – which explains a bit. However, everything else is relatively consistent from month to month; his pitch distribution, his velocity, his spin rate, etc. Could it have been a matter of rust and a nagging injury? That seems reasonable, right? Holland, who turned 33 a few weeks ago, has seen his velocity dip over time, though. And he’s at an age where we shouldn’t expect that to rebound. His spin rates actually improved across the board last year, relative to 2017, so there’s still a bit of upside in his offerings. At the very least, this is not a matter of his pitches slipping across the board as we saw with Allen. Neither MLBTR nor FanGraphs have Holland among their top-fifty free agents, so there’s no contract prediction to be had. However, given his back-to-back one-year deals, his career-worst 2018, and his age, it stands to reason that he could be had on a one-year deal. And, when it comes to a one-year deal, I’d be all-in on Holland. I wouldn’t expect his 2011-2014 greatness, nor would I count on him pitching as well as he did for the Nationals last year – but there’s enough there to suggest that he’s not quite done, and that his Cardinals struggles are not the new normal. Why is a 38-year-old reliever that had a 5.47 ERA last year on this list? There are reclamation projects, and there are lost causes, right? Maybe. 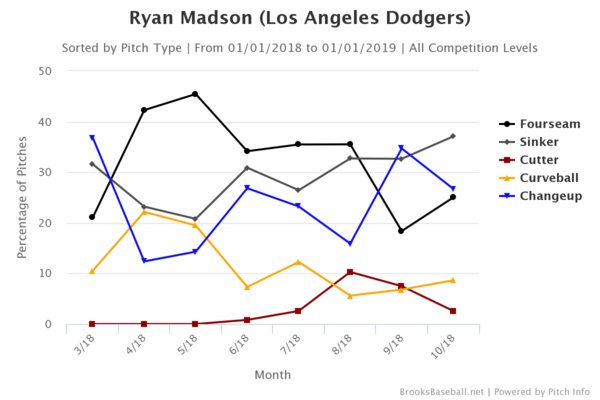 Or maybe there’s a bit more to Madson’s 2018 season than meets the eye. 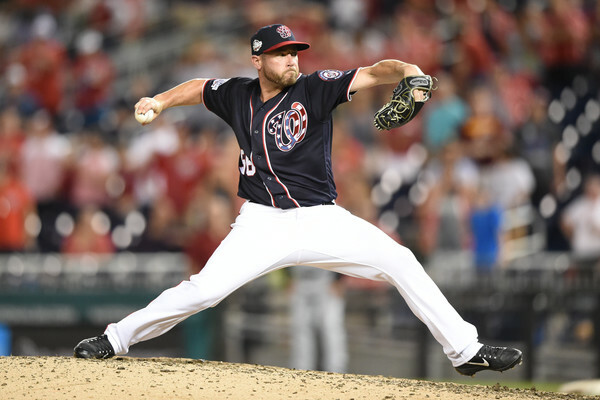 In late October, the Washington Post reported that Madson had been dealing with low-back pain that radiated down his front leg throughout the season, and didn’t have it straightened-out until August, when he made adjustments to his delivery. And then the Dodgers overhauled his approach after acquiring him in an August deal from the Nationals, and it paid dividends. 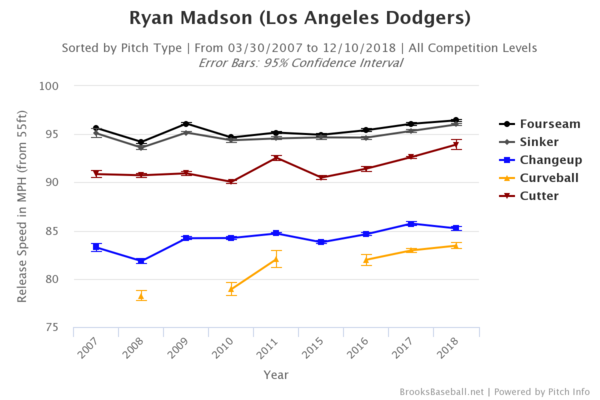 Sure, Madson’s 6.48 ERA with the Dodgers looks ugly; but he had a 36.1 K% and a 2.8 BB%, and was largely done in by a ridiculous .429 BABIP. His 1.96 FIP in Dodger Blue tells a better story of how he was in those stretch-run appearances. 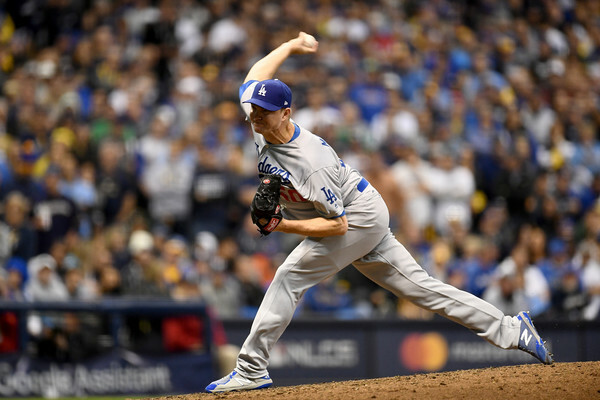 The Dodgers leaned on Madson heavily in the playoffs, calling upon him 11 times, and he responded admirably, pitching to a 2.08 ERA in 8.2 IP. As was the case with Holland, there aren’t many contract estimates out there for Madson. And why would there be? He’s a 38-year-old reliever, after all. But, given his apparent health, new approach, and still-strong velocity, he might just be a bargain on a one-year deal. And I would be happy to see that deal be with the Yankees … as long as he’s not the premier reliever signed this off-season. The first day of the 2016 Winter Meetings came and went without a move for the Yankees. Two of their reported free agent targets, Rich Hill and Mark Melancon, signed with other teams. Now that Matt Holliday is on board as the DH, pitching is the top priority, and Brian Cashman is being open-minded. “From my perspective, I’m open-minded to anything. I think it’s in your best interest to always be that way,” said Cashman to Bryan Hoch. On Monday we learned the Yankees are still pursuing both Aroldis Chapman and Kenley Jansen, though they won’t go all out to sign them. Chapman, by the way, wants a six-year deal. The Yankees are also in the hunt for Luis Valbuena and a left-handed middle reliever. We’re again going to keep track of the day’s Yankees-related rumors right here, so make sure you check back throughout the day for updates. All time stamps are Eastern Time. 12:13pm: Take this one with a grain of salt: the Yankees are reportedly “close to a deal” to acquire Gio Gonzalez for two prospects and possibly a third piece, according to Rich Mancuso. The deal is contingent on the Nationals getting Chris Sale, a la the Starlin Castro trade and Ben Zobrist last year. The Yankees have had interest in Gio in the past. This rumor does pass the sniff test, though I’d like to see some familiar names corroborate the report before fully buying in. 12:41pm: For what it’s worth, Mark Feinsand says there’s no truth to the Gio rumor. Jayson Stark says the Nationals would make him available following a Sale trade, however. 12:54pm: Jack Curry shot down the Gio rumor as well. Carry on. For the first time since 2013, the Yankees have made it to November 17th without making a trade or free agent signing. Last winter they made the John Ryan Murphy-Aaron Hicks trade on November 11th, and the year before they re-signed Chris Young on November 9th and made the Francisco Cervelli-Justin Wilson trade on November 12th. So far this year all we have is a Joe Mantiply waiver claim. Lame. Here’s the latest hot stove buzz. According to Rob Bradford, the Yankees are among the most interested teams in free agent Carlos Beltran. The Red Sox, Blue Jays, and Astros are also in the mix. There are no shortage of DH bats available this winter. Beltran is part of a group that includes Edwin Encarnacion, Mark Trumbo, Mike Napoli, and others. We could include Jose Bautista here too. Kendrys Morales was in that group before signing a three-year deal with the Blue Jays last week. Beltran had a very productive season for the Yankees before being traded to the Rangers, where he was just okay. You could do a heck of a lot worse than signing Carlos to be your short-term DH, which is something the Yankees will probably need should Brian McCann get traded away. That said, after seeing Alfonso Soriano and Mark Teixeira and Alex Rodriguez go from very productive to toast in an offseason in their late-30s, bringing Beltran back makes me a little nervous. As part of their search for “pitching, pitching, pitching,” the Yankees have already reached out to free agent right-hander Jason Hammel, according to George King. Hammel became a free agent last week when the Cubs surprisingly declined his $12M club option. They had to pay him a $2M buyout anyway, so it was a $10M decision. Apparently the Cubs threw Hammel a bone and let him decide whether he wanted to come back, and he instead opted for free agency, because he’s not a moron. Anyway, the 34-year-old Hammel had a 3.83 ERA (4.48 FIP) in 166.2 innings this past season, and over the last few years he’s worn down and been close to a non-factor in September. He’s more of a 150-inning guy than a 180-inning guy. Hammel has been very homer prone the last few years (1.28 HR/9 since 2013) and I can’t imagine moving into Yankee Stadium will help matters. Still, he’s one of the best free agent starters on the market, so the Yankees are smart to check in. It never hurts to see what a guy wants. The Yankees, along with the Pirates and Padres, have shown early interest in free agent lefty Derek Holland, reports Jeff Wilson. The Rangers tried to trade Holland earlier this offseason, but after finding no takers, they decided to decline his $11.5M option and instead pay him a $1M buyout. It’s entirely possible Holland is the second best left-handed starter in free agency behind Rich Hill. It’s either him or Brett Anderson. Egads. Holland had a 4.95 ERA (4.75 FIP) in 107.1 innings last season. He’s been limited to only 203 innings the last three years due to all sorts of injuries, including knee and shoulder trouble. Holland has five pitches (four-seamer, sinker, slider, curveball, changeup) and PitchFX clocked him in the 92-94 mph range this year, so the 30-year-old still may have something to offer. Would he take a one-year contract to rebuild value in Yankee Stadium? Maybe! But the odds (and common sense) are against it. Now for the other Holland. According to George King, the Yankees have contacted agent Scott Boras about free agent Greg Holland, who is working his way back from Tommy John surgery. Holland threw for scouts last week and the Yankees were among the many teams in attendance. “Over 20 teams (have called). Most teams are doing their due diligence,” said Boras. Holland, 30, had his elbow rebuilt in September 2015, so he’s 14 months out from surgery. Reports indicate he was 91-92 mph during his workout last week, down considerably from his peak, but I don’t think that’s alarming. He’s still rebuilding arm strength. His health is obviously most important, but after that you’re looking at his mechanics and the effort in his delivery. A free and easy 91-92 is much different than max effort 91-92. I can’t help but think Holland is going to wind up with whatever team offers him their closer’s job right away. In addition to McCann and Brett Gardner, the Yankees are also open to moving Chase Headley, reports Ken Rosenthal. This isn’t surprising. The Yankees reportedly made Headley (and Jacoby Ellsbury) available at the trade deadline. It only makes sense to put him out there again now. The free agent third base market is Justin Turner, Luis Valbuena coming off hamstring surgery, and nothing else. There are few quality hot corner options available. The Yankees have outfield replacements for Gardner and Ellsbury, and they’ve already replaced McCann behind the plate, but they’d have to go out and add a third baseman should they trade Headley. That’s not insignificant. I love Ronald Torreyes as much as the next guy, but giving him 500+ plate appearances seems like bad news. That isn’t to say the Yankees should hold on to Headley because they lack a third base replacement. By all means, see what the market offers. It just means this is a two-step process. Trade Headley, then find a replacement. Holland, who turns 31 later this month, blew out his elbow late last season, one year before free agency, so the Royals non-tendered him. That’s basically what Nathan Eovaldi is going through right now. Holland had a 1.86 ERA (1.92 FIP) with a 35.2% strikeout rate in 256.1 innings from 2011-14 before slipping to a 3.83 ERA (3.27 FIP) with 25.4% strikeout rate in 44.2 innings in 2015, likely because his elbow was barking. I have some thoughts on this. 1. Of course Holland is worth a look. There’s no reason for the Yankees — or any other team, for that matter — to not go see what Holland looks like at his workout. Every club has scouts in Arizona. It’s not out of the way. Pop on by the workout and see what he looks like 13 months out from surgery. Even if you don’t sign him, it’s something for the ol’ information bank you can refer back to later. Once upon a time Holland was a really great reliever, and there’s a chance he will still be a really great reliever after Tommy John surgery. Tommy John surgery is pretty risky — the procedure itself may be routine, but the rehab sure isn’t — and it’s possible Holland’s days as effective big leaguer are over. It’s worth finding out though. Get eyes on him at the workout, and if he looks good, try to sign him. 2. The Yankees could, in theory, offer him the closer’s spot. Holland is a former All-Star closer, and I have to think he’s looking to return to the ninth inning as soon as possible. That’s where the glory is, and, most importantly, that’s where the money is. Two relievers could have the exact same season, but the guy who does it as a closer will get more attention that the guy who does it as a setup man, guaranteed. The Yankees are actually in position to offer Holland their closer’s job. I absolutely believe Dellin Betances could close. Zero doubt about it. I also believe Betances is most valuable in a setup role, where Joe Girardi is more willing to extend him a bit and use him in the game’s most important situation regardless of inning. Holland could close while Betances returns to the fireman role he’s filled so well the last few years. Now, does it make sense to trust a dude coming off Tommy John surgery in the ninth inning? That’s debatable. I guess it depends how Holland’s stuff rebounds following elbow reconstruction and how he looks in Spring Training. I honestly don’t think any team will guarantee Holland their closer’s job. Not so soon after elbow surgery. Obviously some teams are better positioned to quickly move him into the ninth inning though. The other problem is the Yankees will reportedly go after one of the top available relievers, presumably Aroldis Chapman. Holland will figure out for himself which team offers the greatest opportunity to return to closing. Getting stuck behind Betances and possibly Chapman (or Kenley Jansen or Mark Melancon) on the closer depth chart might not be so appealing. 3. Signing Holland shouldn’t deter the Yankees from sign another top reliever. Holland should be looked at as a lottery ticket. He’s not someone you can count on to be a key part of your bullpen so soon after surgery. I don’t doubt his stuff or anything. The guy has nasty, nasty stuff. We just don’t know how Holland is going to rebound from Tommy John surgery, especially short-term. That applies to every pitcher ever. Because of that, I think you have to view him as a lottery ticket. An extra piece of depth. And if Holland can help out at some point in a high-leverage role, great. That makes the bullpen even more dangerous. The Yankees are reportedly going to be in the market for a top reliever and that shouldn’t include Holland. He’s essentially a reclamation project. The master plan should be Chapman or Jansen and Holland, not Chapman/Jansen or Holland. Go add that big lockdown bullpen arm, then add Holland on top of that. That’s the best way to go about this. Don’t count on him for anything. It should all be gravy.